Fruit leathers, also called roll-ups, are a healthy, portable food. Kids love them as a snack, and they are lightweight and take up very little space, which makes them perfect to take on hikes. They are also easy to make. You can make fruit leathers from fresh fruit, but they are also excellent when made with canned fruit. If you put up a few too many jars of applesauce or pear butter last year, this is a perfect way to make sure it all gets eaten. 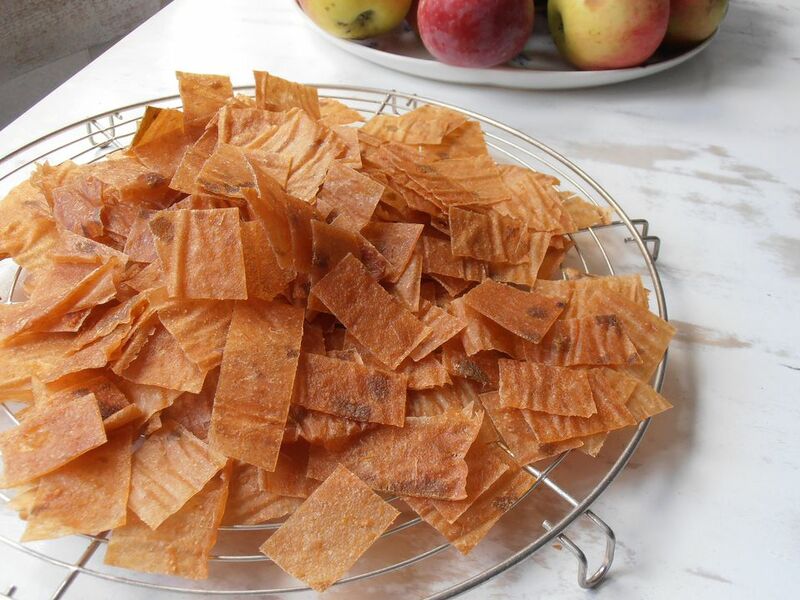 If you have a dehydrator, that is a more energy-efficient way to make fruit leathers than using your oven. But both methods yield delicious results. Fresh fruit has to be heated to kill off potential pathogens before using it to make fruit leather. Because canned fruit has already been heated, you can skip that step when using it. If you are using canned fruit that is already pureed, such as applesauce, skip to either the dehydrator or the oven method below. Let larger chunks of fruit such as peach halves drain in a colander for a few minutes. If the fruit was canned in a sugar syrup, rinse it briefly with water and then let it drain. Transfer the drained fruit to a blender or food processor and puree. Line the trays of your dehydrator with plastic wrap or non-stick dehydrator sheets. If using plastic wrap, tuck the edges under the trays so that the wrap won't flop over onto your fruit while it dries. Put 1 cup of fruit puree in the center of each tray. Spread with a spatula until it is between 1/4 and 1/8-inch thick. Be sure to spread the puree evenly so that all areas of the fruit leather dry in the same amount of time. Place the trays in the dehydrator and dry at 140F/60C. Start checking for doneness after 4 hours. Your fruit leather is ready when it is translucent, only slightly sticky to the touch, and peels easily away from the plastic wrap or non-stick sheet. Note that fruit leathers can take anywhere from 4 to 10 hours to dry depending on how thickly the pureed fruit was spread and the density of the fruit. Let the fruit leather cool to room temperature. To store, roll it up in plastic wrap or waxed paper, making sure all the surfaces are completely covered, including the edges. Very lightly grease a baking sheet with vegetable oil (cooking spray is useful here). Alternatively, line a baking sheet with plastic wrap. If using plastic wrap, tuck the edges under the tray so that the wrap won't flop over onto your fruit while it dries. Two cups of fruit puree are enough for a 12 by 17-inch baking tray. Put the puree in the center of the tray. Spread with a spatula until it is between 1/4 and 1/8-inch thick. Be sure to spread the puree evenly so that all areas of the fruit leather dry in the same amount of time. Turn the oven to its lowest setting, between 140F/60C to 145F/63C (you want to dry the fruit, not cook it). Start checking for doneness after 4 hours. Your fruit leather is ready when it is translucent, only slightly sticky to the touch, and peels easily away from the baking tray or plastic wrap. Note that fruit leathers can take anywhere from 4 to 10 hours to dry depending on how thickly the pureed fruit was spread and the density of the fruit.